One year, one of our staff members, let’s call her Amy, cross-country skied on Clingman’s Dome Road. This 7-mile road leads up to the highest point in the Smokies, Clingman’s Dome, at 6,643 feet. This road is a popular tourist destination in the warmer months, but in the winter it is closed to all motorized vehicles(until April 1). This high elevation road probably gets more snow than anywhere else in the Park! And since it is closed in the winter, it never gets plowed, creating great conditions for great cross-country skiing and snowshoeing! Those that are feeling ambitious go the whole distance to Clingman’s Dome – 14 miles round trip! When they arrive at the Clingman’s Dome Observation Tower, they may have the whole place to themselves – a rare occurrence at this popular spot! Amy wasn’t feeling quite that ambitious, so she skied 2 miles in and 2 miles out. It is amazing how much it snowed that winter here in the Smokies! It made for some treacherous driving, but was also great for winter sports! Up on Clingman’s Dome Road there were between 10 inches and 2 feet of snow (depending on how sunny or shady the spot)! What started out as near perfect powder, became somewhat sticky beneath Amy’s skis as the day warmed up. After an hour or so, she took a break and decided to build a snowman! Over the next half hour Amy had a blast building her creation, which ended up being a snowbear! At first she was sad to leave him, but she was glad that she didn’t have to watch him melt! Hopefully he made a few people smile as they passed by in the following days! Unfortunately we don’t know of ANY places around here that rent cross-country skis or snowshoes. Usually we don’t get that much snow, so renting out these items probably hasn’t been profitable in the past. If you are coming to visit Gatlinburg from far away, our advice is to find some cross-country skis or snowshoes before you leave and bring them with you! You can always find them online too. Try Craigslist for a used pair – our friend Amy actually found a few used pairs in the Knoxville area! If you decide to try out Clingman’s Dome Road this winter, we hope you have fun! We recommend parking right beside the closed gate, off to the side so that other cars can get by. The Park Service might prefer that you park in the Newfound Gap parking lot, but then you would need to walk on the sometimes busy road, so we’re not sure which is preferable. Use your best judgement! Make sure you bring everything you normally would for hiking: water, hat, gloves, sunglasses, snacks. Keep in mind that you will warm up fast since this is GREAT cardio! This is where layering is important. Amy only wore her jacket for about 5 minutes! Then it stayed in her backpack for the rest of the day. It’s Free – lift tickets can be EXPENSIVE! No Lifts – you don’t get cold sitting on the lift. You can bring your dog, and it’s great exercise for him too! You can do it in your backyard, and a bunch of other places! Easy to learn (and less painful). You can watch winter wildlife and look for tracks. It gets you outside and into the sun, which helps beat winter blues. The 23rd Annual Wilderness Wildlife Week will be Jan 12 – 19 in Pigeon Forge, at the Music Road Hotel & Convention Center. This is a GREAT event for the whole family, and it’s all free!! “The theme of Wilderness Wildlife Week™ in Pigeon Forge, involves a continuous thread of wholesome, family oriented, tasteful integrity beginning with the originators and continuing throughout every presentation and excursion associated with the event. It is a constant aim and commitment that Wilderness Wildlife Week™ proceeds and succeeds as an event of the highest standards and principles and that it be obvious to every participant that this is a safe, encouraging and giving event.” This event includes tons of workshops and lectures, more than 40 guided walks and hikes, and even a photography contest! Don’t miss out! You can view pages and pages of the amazing workshops and lectures available! Here are just a few of the ones that look interesting to me, just to get you a little excited too! Join Jerry Wear as he discusses the manufacturing of iron in Pigeon Forge around 1820. This early industry is almost unimaginable in today’s bustling vacationing resort town. Bears, Boars and Bulls: A Wild Life in the Smokies! For detailed information on all the wonderful things available as a part of the Wilderness Wildlife Week, visit their site! One of our staff members visited a very special place in Great Smoky Mountains National Park that few people ever get to see: Gregory Bald. Gregory Bald is a 10 acre grassy bald on the Tennessee – North Carolina state line in the western part of the Park. The only way to access the bald is by hiking to it via Gregory Ridge Trail (5 miles) or Gregory Bald Trail (4.1 miles). When originally built in the 1930’s, the Appalachian Trail crossed Gregory, but it has since been moved. What is a Grassy Bald? A grassy bald is basically a mountain with a field on top. The origins of these balds are unknown and there are several different sides to the debate. Most balds are believed to be man-made and were originally kept open by livestock grazing. Today many grassy balds are kept open for their historical value, by mowing or grazing. On other balds, the forest is gradually moving back in. If you are interested in the history of grassy balds in the Smokies, we found an interesting online book discussing the topic. In addition to Gregory Bald, there are several other grassy balds in the Smokies: Russel Field, Spence Field, Silers, Andrews, Parsons and Hemphill Balds. Of these, only Gregory Bald and Andrews Bald are maintained by the Park Service. Learn more about the restoration of native vegetation and landscapes in the Park. Of all the grassy balds in the Park, Andrew’s Bald is probably the shortest hike. From the Clingman’s Dome parking lot, hike for 1.7 miles on Forney Ridge Trail and you will find yourself standing on Andrews Bald. Although this trail is relatively short, it is fairly rocky and is not for everyone! The southern Appalachians have several other grassy balds outside the Smokies. Just over an hour away, Max Patch is a grassy bald in the Pisgah National Forest that can be driven to for easy access. Another popular grassy bald to visit is Roan Mountain, which is maintained through grazing. The most stunning thing about Gregory Bald is the azaleas! Azaleas are flowering shrubs closely related to Rhododendrons. Every year in mid-to late June, the azaleas of Gregory Bald bloom in a full spectrum of colors! It really is a beautiful sight! When our staff member was up there, she was told it was a little too early for the peak bloom. As you can see, a lot of the azaleas were budding, but not yet in full bloom. Actually she thought the buds were just as beautiful as the flowers! The most common azalea species in the Park is the orange flame azalea,which grows at a wide range of elevations. Other azaleas in the Park are sweet azalea, pink azalea, and clammy azalea. On Gregory Bald, many of these species hybridise to produce a rainbow of different colors! If you ever get a chance to hike up to Gregory Bald and see these beautiful flowers, you will be glad you made the trek, because this place is quite spectacular! Article quoted from Great Smoky Mountains National Park website. Fall colors are nearing peak at high elevations in the park. Some trees are still green, but yellow and golds are becoming predominant along roadways above 4,000 feet elevation. Newfound Gap Road near the crest of the mountains and Clingmans Road are particularly nice at this time. At lower elevation, early trees are turning now, but these are scattered patches of color–the majority of trees at low elevation are still green. Dogwood, black gum, sourwood, sumac and Virginia Creeper are among the species showing red color at lower elevations now. Fall wildflowers are blooming in abundance along park roadways. Look for goldenrod, asters, snakeweed, and jewelweed. The park usually experiences an autumn leaf season of several weeks as fall colors travel down the mountain sides from high elevation to low. However, the timing of fall color change depends upon so many variables that the exact dates of “peak” season are impossible to predict in advance. Elevation profoundly affects when fall colors change in the park. At higher elevations, where the climate is similar to New England’s, color displays start as early as mid-September with the turning of yellow birch, American beech, mountain maple, hobblebush, and pin cherry. From early to mid-October, fall colors develop above 4,000 feet. To enjoy them, drive the Clingmans Dome Road, the Blue Ridge Parkway, or the Foothills Parkway. The fall color display usually reaches peak at mid and lower elevations between mid-October and early November. This is the park’s most spectacular display as it includes such colorful trees as sugar maple, scarlet oak, sweetgum, red maple, and the hickories. Autumn is both a beautiful and a busy time in the Great Smoky Mountains. The annual show of fall colors attracts huge numbers of sightseers, especially during the last three weeks of October. Areas in the park which experience the longest traffic delays are Cades Cove and Newfound Gap Road (U.S. 441). Try some of these suggested autumn drives and hikes to enjoy fall leaf colors in areas of the park that are a little less crowded. Why are fall colors so remarkable in the Smokies? One reason is the park’s amazing diversity of trees. Some 100 species of native trees live in the Smokies and the vast majority of these are deciduous. There are no motels or rental cabins located within the national park. However, communities surrounding the national park offer a wide choice of accommodations including hotels, cabins, bed and breakfasts, and campgrounds. October is a busy month in the park, so it is advisable to make accommodation reservations as early as possible. Information about accommodations in the surrounding communities. Vividly colored fall leaves leaves may grab your attention, but don’t overlook the park’s fall wildflowers which bloom in profusion along roadways! People love to come to the Smokies to celebrate Independence Day! Parades, concerts, fireworks, cookouts, hiking, water activities, and more compel people to return for the excitement year after year! Take your pick, or do your best to join in every celebration! The first Independence Day parade in the nation marks its 37th year with a happy birthday wish for the United States of America on July 4, 2012, in the foothills of the beautiful Smoky Mountains. For the 37th consecutive year, Gatlinburg kicks off America’s celebration with the nation’s first parade, which leads off in the opening moment of the holiday at 12 a.m. on Wednesday, July 4, to the cheers of close to 100,000 spectators. Members of the U.S. Army, Navy, Marines, Air Force, and Coast Guard, plus vintage military vehicles, local area public safety agencies, and lots more will appear in the parade. Check out the parade route early to choose your best observation spot as some of the tens of thousands of spectators will start placing their folding chairs along the route as early as 7 a.m. on July 3. All this and much more will be featured in the parade! 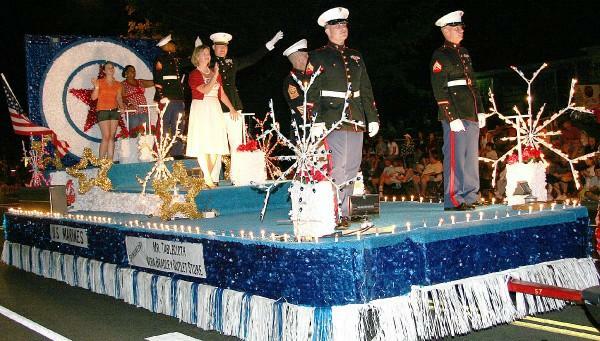 For more information about the 37th Annual 4th of July Midnight Parade, please call 800-56-VISIT (568-4748). If you don’t stay up too late for the parade, or perhaps if you just stay up all night, you can take your kids (or the young at heart) to join in the festivities at the river raft regatta. Kids may register to enter anything floatable in the regatta thats registration will begin at 10 am at the Christ in the Smokies bridge on River Road beneath the chair lift. 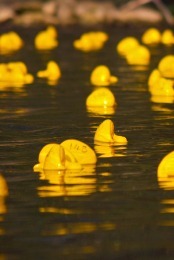 Actual Regatta is expected to start at noon, with registration beginning at ten a.m . “There will be prizes for the top three places in these divisions: Hand-made Decorated, Floatable Object (no creativity), Small Entry (pill bottle sized), Oldest Entry, Youngest Entry, Judges Choice (or most unique), Ripley’s Believe It or Not Entry. Trophies will be supplied by the Gatlinburg Recreation Department.” During registration there will also be tons of games available on the lawn. Come on down! You’ll probably need a nap in the afternoon, but make sure you wake up in time to see the fireworks finale which takes place at ten p.m. This has been designated a Top 20 event by Southeast Tourism Society! The best way, in my opinion, to enjoy the parade is from the comfort of your own cabin. Granted, there is something to be said for the excitement of being down on the street. However, I prefer the more comfortable, laid back atmosphere of a cabin with a view of downtown. Share drinks and h’ordeuvres (snacks!) with that special someone or maybe a small group of friends as you relax and enjoy the fireworks from the decks of your own Smoky Mountain cabin! 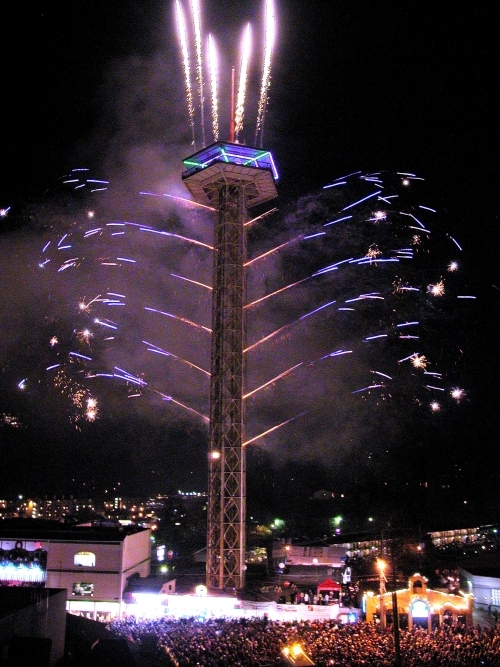 ERA in the Smokies has cabin rentals available with a perfect view of the fireworks. Call and reserve soon before they’re gone! Celebrate America’s independence during the annual Patriot Festival in Pigeon Forge on July 4th at Patriot Park! Festivities will begin at noon and end at 10:00 pm. Come enjoy a day filled with food, games, entertainment, fireworks and plenty of fun for the entire family. This year’s featured entertainers include country artist John Anderson, whose hits include “Swingin’” and “I’m Just An Old Chunk Of Coal,” and Rock and Roll Hall of Fame members The Lovin’ Spoonful, famous for tunes like “Summer In The City” and “Nashville Cats.” The Pigeon Forge Patriot Festival lineup also includes country newcomer Chris Janson! Parking, trolleys and admission to Patriot Festival are all free! So grab your blankets, lawn chairs and sunscreen and join the celebration. No umbrellas, please. For more information about Patriot Festival, call the Pigeon Forge Office of Special Events at (865) 429-7350.